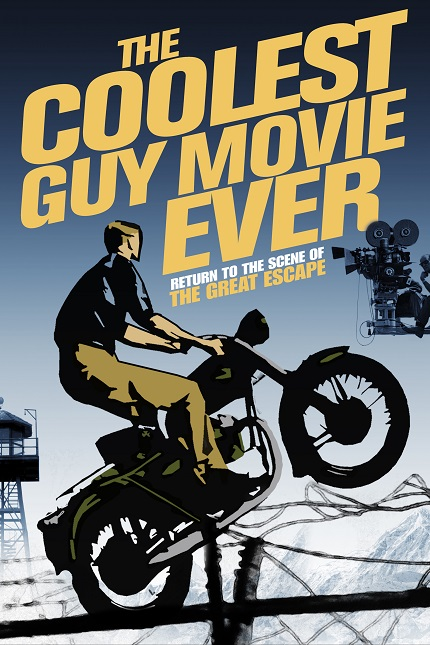 From filmmaker and film historian Chris Espenan comes "The Coolest Guy Movie Ever" — a fascinating forensic documentary about the making of the classic World War II adventure film "The Great Escape" — to DVD and digital HD from Virgil Films on August 21, after a special screening earlier this year at Marché du film in Cannes. Before Evans, Hemsworth and Downey Jr. there was McQueen, Garner, and Bronson. These men represented what it meant to be tough guys in the 1960s, and they had the acting chops to play the toughest characters around – including the real life airmen who pulled off one of the most improbable escapes in war history. The filming locations of the enormously popular World War II adventure "The Great Escape" have become enshrined over the years by film buffs and historians alike, forever changing the landscape of the small German towns that once played host to these Hollywood heavyweights. Now for the first time, Filmmaker Chris Espenan set out to visit all of the locations in Germany where the 1963 film was made, while compiling facts, behind-the-scenes stories and inside information on how the film was produced. From visiting Geisel Gastag Studios in Munich to the Bavarian town of Füssen, Espenan assembled a unique team of cameramen, historians, film buffs, and local experts who painstakingly found the exact spots where actors Steve McQueen, James Garner, Richard Attenborough, Charles Bronson, James Coburn, David McCallum and others toiled in the summer of 1962. Uncovering treasures such as footage from a German television news shoot — which included a rare interview on the set with Steve McQueen — to getting first person interviews from the locals who were there during filming, "The Coolest Guy Movie Ever" is a true labor of love, fashioned by filmmakers who exult "The Great Escape" as one of the most memorable World War II movies ever made, featuring one of the greatest casts ever assembled, and for many, indeed, "The Coolest Guy Movie Ever."